A true comfort food, this Tuscan-Style White Bean and Sausage Soup makes a delightful, cozy dinner on a cold winter’s day. I love how the flavors of this soup come together and warm your home with the most amazing aromas. If I want to kick things up a notch, I’ll use spicy Italian sausage instead of the mild. It’s SO good! And this Weight Watchers soup recipe doesn’t take a lot of time or effort to prepare…just around 30 minutes. Another great healthy dinner idea for when you are short on time. Totally looks like a gourmet soup, but is fast and easy to prepare. If you prefer a creamy texture to the soup, just process one of the cans of beans before adding them to the soup. You can leave the other can of beans whole. That will add some thickness to the broth, while still leaving some beans whole for texture. I personally like it with a broth-y base so I can dip some toasted crostini or garlic bread into it. And at just 6 Smart Points per serving, this satisfying soup is an ideal dinner or lunch that will definitely fill you up. Enjoy! 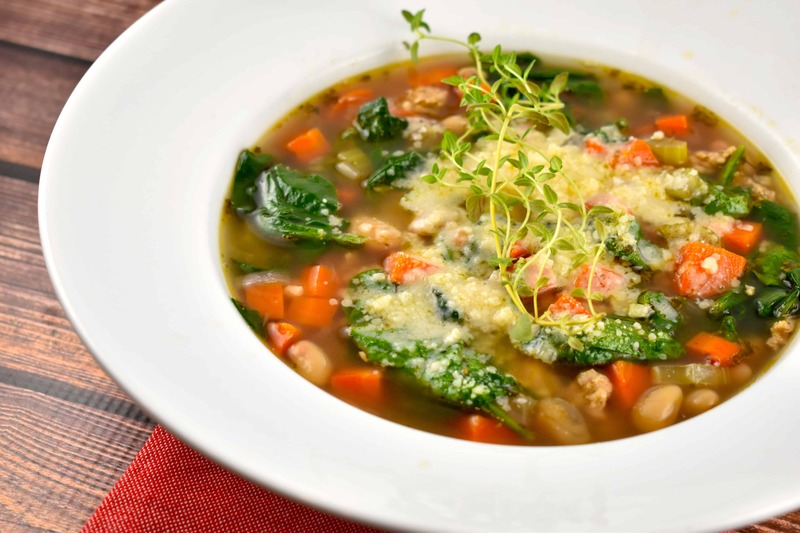 A delicious, Tuscan-style soup that’s brimming with protein and fiber to keep you full. Lots of gourmet flavor, but super simple to prepare. Heat oil in a large pot or dutch oven over medium high heat. Add in sausage, and cook, while breaking up with a wooden spoon, until browned. Stir in garlic, onions, carrots, celery, and cook until vegetables begin to soften, about 8-10 minutes. Add in beans, broth, bay leaves, oregano, thyme, and salt and pepper. Bring to a boil, then reduce heat to medium low, cover with a lid, and cook for about 30 - 45 minutes. Turn heat up to medium, bringing the soup back to a simmer, and stir in the spinach. Cook, uncovered, until it becomes slightly wilted. Remove from heat and remove bay leaves. Season with additional salt and pepper if desired. Ladle into bowls, and top with 1 tbsp grated Parmesan cheese. I just made this for dinner. It’s amazing…..it is definitely going into my rotation. I made this soup last week and loved it so much I gave the recipe to my sister who is going to try it. I am on my 2nd batch. I use the thin n trim chicken sausage which is 5 points for the whole pound. Is this a Free Style soup. Yes! It is :) So, the beans and the veggies don’t count towards the Points value. I just used the WW calculator to confirm the SmartPoints……it reads 10 not 3 per serving. Am I wrong? It may vary depending on what brand/type of ingredients you use. For example, the chicken sausage I use is pretty low in calories and fat. But there are SO many kinds. So, depending on which one you use, your Points may vary. It also depends on what WW calculator you are using. With WW Freestyle beans are now 0 Smart Points, as well as the vegetables. Are you using the new Freestyle Calculator or current WW Member app? Also if you enter the nutritional info in the calculator it will add the nutritional info for the beans & other 0 Smart Point foods. The WW recipe builder is your best bet on calculating the SP values on recipes. I hope this helps. After entering the recipe into the Weight Watchers site, it came to 4 points and not 3. You say to stir in garlic; how much? Can’t wait to try this!